They say that diamonds are a girl's best friend. Conversely, I aver that diamond plate is a guy's choicest amigo, and that, if you find its price acceptable, could make today's Nice Price or Crack Pipe Samurai your diamond-plated bestie. What if, the Germans built a Range Rover…? Oh wait, they did, and in fact still do, the older than dirt Mercedes G-Class. We love those Teutonic terrain-topplers, but not so much when they come with some assembly required. That was the issue with yesterday's 1985 280GE, which not only had some rust-through issues in important places like where you put your feet, but also had the front-end shimmy that seems pretty endemic to these beasts. Overall, the problems outweighed the price and while we hated to see it end this way, it went down in a 63% Crack Pipe loss. Consider if you will the opposite ends of the '80s 4x4 spectrum. In the rarified air at the top lived beasts such as yesterday's Benz and the Range Rover, while down where size and price were significantly more picayune there was the Suzuki Samurai. Pocket-sized and with a worse reputation for going bottom's up than Farrah Abraham, the little Suzuki was that brand's first foray into four-wheeled transport here in the United States. Priced commensurate with their size, these mini-Jeeps proved pretty popular until Consumer Reports reported to consumers that they wouldn't be caught dead in one lest they be caught dead in one. Some people see that kind of warning and resultant reputation - earned or otherwise - as a challenge and hence the Samurai has developed a sizable following as a used car even today, decades past its sell-by date. Few that you see these days tend to be stock however, as their cheap seats prices and puny powerplants tend to make them prime candidates for extensive mods. 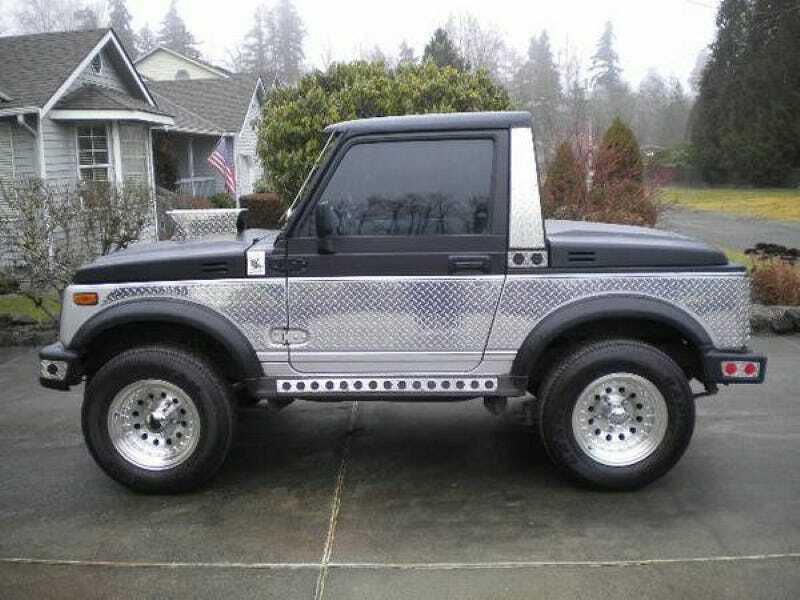 This 1987 soft top Samurai is just such an example. Apparently however its modifications are of the visual nature as it still sports its all-alloy 1.3-litre 60-horse four pot and 5-speed manual gearbox. That powers a body on frame that rides on a diminutive 79.9-inch wheelbase and features a semi-elliptic leaf spring at each corner. So, if the 4x4 drivetrain is still stock, where did the money go? Well, obviously not into keeping the odo spinning as the ad claims the gauges stopped working and hence the truck's total mileage is unknowable. No, the money went into diamond plate, that coolest of the cool metal surfaces that here covers both flanks and the rear gate, as well as the bumper fillers, license plate frames, and what looks to be a mailbox mounted on the hood. That manly covering brings the bling but what is perhaps the funniest aspect of this little trucklet is the fact that here's a redundant hood (bonnet to you anglophiles) used as a bed cap and both it and the real hood are fronted by HUMOR rather than HUMMER. That's some quality whimsy right there. What does it take to park this jocular jumper in your driveway? Well, the ad asks $4,500 and now it's time for you to vote on that and your opinion of how it equates to this truck's worth. What do you think about this HUMOR for $4,500? Does that price mean you'd be laughing all the way to the bank? Or, does that mean the joke's on you?